Yesterday I was delightfully surprised to receive a big envelope from cousin Bobbie who lives in NM. She sent a hard copy of the Huntington 13 newsletter and CDs of it. 13 refers to our generation. Simon (generation 1) Huntington and wife Margaret Baret sailed from England in 1633. He died from small pox aboard ship and was buried at sea. In the mid 1850s my line of this family went from VT to WI. One small cemetery in North Pittsfield, WI has 3 generations of great grandparents buried there. In May 1920 my great grandparents Charles S. and Lillie Ann Victoria Carter Blondheim, along with their 4 living children Pirlie, Adie, Corlis and Gordon came to NY. Charles and Lillie were originally from St. Lawrence Co., NY. Their oldest daughter Pirlie Dorcie met and married Clark Ray Huntington in WI. My mother Dorcie was their oldest child. Also with them on that trip were their other children Avis, Orval and Forrest. Two more children Reva and Belva were born in NY. Aunt Adie and Uncle Paul Regal were also on that journey with their children Violett and Edith. The Blondheim-Huntington families came here by train, excepting Uncle Corlis who drove his father's car out. There were 6 adults, 1 teenager and 6 children under 10 on that train trip. Mom was 5 and remembered very little about the journey. Grandpa and Grandma Huntington settled on the Tunnel Road on what is called the Altitude Farm. It is at one of the highest points in Broome County. 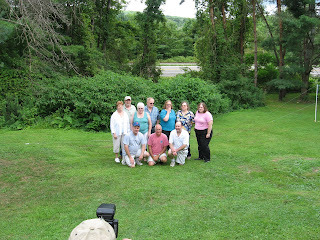 This summer 10 of the 19 cousins in Generation 13 gathered, some not having seen each others for many years. We had children and grandchildren with us that day. All six of Generation 12 are now deceased and one aunt by marriage is still living, Uncle Forrest's widow. The last time I saw cousin Belva she talked about a family newsletter. I mentioned this to Bobbie and it was a done deed. Bobbie also edits a newsletter for her mother's family. What fun we had bringing out old pictures and remembering things about Grandpa and Grandma. As the oldest cousin I was able to remember a lot about the family that nobody else did. Thanks to Bobbie for those gentle hints to get it written. She scanned pictures, edited my ramblings, drew sketches of a house our grandparents lived in and did all the computer work involved. For those who don't know me well, genealogy has been my hobby since the late 1960s. When I've done genealogy workshops I urge people to write down their memories, even if on scraps of paper. Somewhere in a generation or two someone will be interested in what we did way back in 2008.